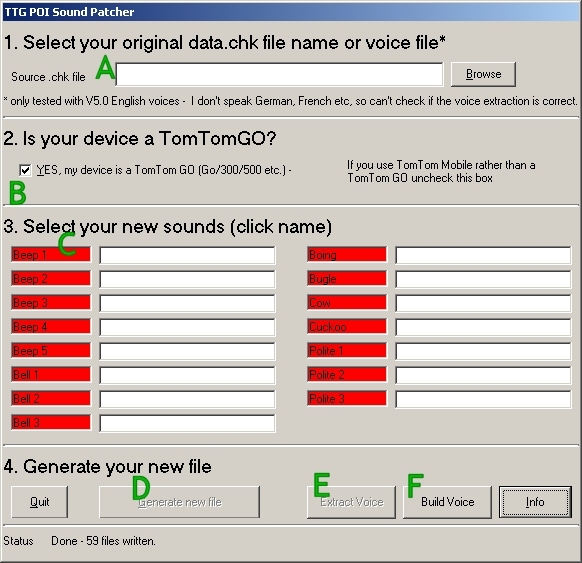 The TTG POI Sound Patcher allows you to change the sounds associated with POI (Point of Interest) entries. It should all be pretty self explainatory - Start at 1 and go through to 4 - easy huh? 1. Error checking... ooh don't make mistakes ... seriously this is a quick and dirty app - if there's enough interest I'll sort stuff out. 5. If 'A' is a voice sound file, don't use 'D' (generate file) use 'E' (extract voice). I can't check that the non-english voices extract correctly since I don't speak any foreign languages enough to be sure. I could probably work out the 100,200 etc, but that's about it. 8. If POI Sound Patcher doesn't recognise the data.chk file as a known version, it will tell you how many modules are in the file, and warn you that the results may not be correct. You can decide to proceed or not. If you proceed it will attempt to generate a useable file that you can test. If this works please let me know the device that the file came from and what module count POI Sound Patcher reported and I will add it to the next release as a known type. 9. Since the TomTom devices use OGG sound files you will need to convert them, you can download tools for this from vorbis.com or you can use oggdropXPd which allows drag and drop conversion. TomTom Go expects sound files to be 22050Hz, 32-bit or 16 bit, Mono - iirc TT mobile devices expect 16000Hz sounds. 10. If you try and insert a file that's too big (for example a 200kb file), then the application will tell you it's too big and then abort the process. 11. You can build or rebuild voices using the Build Voice button (F) You MUST provide ALL the files, named as per a voice extraction. Simply click the Build Voice button and select the folder that the ogg files are in. The application will check that all the files are there, and if they are, will generate myvoice.chk file in the same folder as the OGG files. You will then need to copy this file to your TTG and rename it as (for example) data98.chk. Thanks to lutz for posting the excel macro on which this is based. There are NO issues with the new version of the OS for the TTG (5.2). Download here and here are some sample oggs for your poi warnings. Here's a voice I put together too. 0.3.10 - added 'special' feature, and ability to 'have a go' if the file is not a recognised one.